I recently got two sets of three flagged (by me) comments declined. The comments were clearly insulting. The first three were to this question where I initially pointed the asker to site-rules and that the questions is off-topic (which apparently I wasn't the only). Instead of at least some lame excuse, OP went rude. I tried to stay friendly, but got another two insults. I flagged all three. After quite some time, instead of just deleting the insults (and possibly context) posts, all comments were deleted. My flags were all declined. 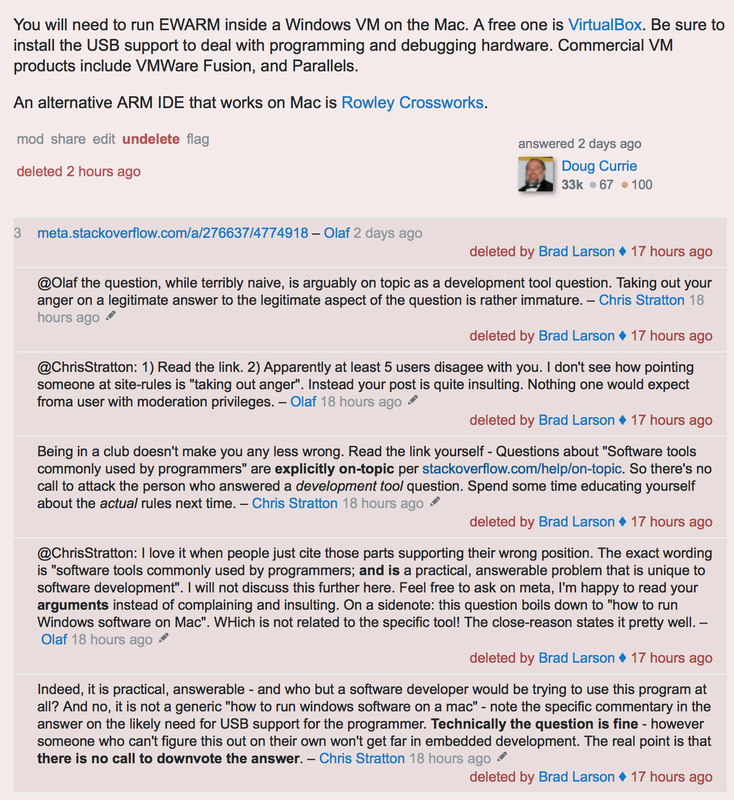 Same for this answer where I only posted a link to a meta post about answering bad questions, no further text. Again, I got some pretty insulting comments, not even by the post owner, but a third user who insisted the question is OT and I should not attack answerers that way (by posting a relevant meta!). I tried to argue reasonable, even others did, but just got more offence. So one more try: flagging. Same result: Flags sticked some time, then all comments were deleted, flags declined. In the meantime, both question were closed for the reasons I already assumed. 5 regular votes, no hammers. So, ok, maybe I should not have tried to reason after the first insult. For the second user being a high rep >30k one I thought I had hope, though. But even if I shouldn't, I don't see how that justifies further attacks. Nevertheless, I would have accepted my flags disputed (which does not have a negative effect AFAIK). I'm also fine with all comments deleted. This would have signaled me "you should have retracted after the first insult". But getting well justified flags declined clearly states: "it is fine you got insulted. Just don't care about the site, don't inform people about their wrong-doing". Fine, if that's intended, I got it, mods. Us users shall not try to help keep this site as fine as it used to be (and should be). Don't point people at the rules. I understand this post is a bit problematic, as I can't show the comments as proof. Nevertheless I try my luck, I haven't given up completely yet. If too many flags are declined in some period, a flag-ban strikes for an undisclosed duration. I had that recently where my flag was errorneously declined while I was (apparently) at the edge of a ban. Acceptable for a single flag, but for three on a row or even six in short succession? To be clear: I accept a ban if there is a good reason; Err'ing is human and I do learn from my errors. But I don't want to get punished for others missbehaviour or errors. The answer to the last questions implies there is a way to send a custom message to the flagger, which would have at least shed some light about the reason. Maybe there is need for some mod-training? The first set of comments are available now. This is the older event. Note that I only posted this meta after the second one. The reason is I was about to accept the declined flags and move on. However, the second one is more clear and not covered by mod resonses until now. Seeing the same procedure there triggered this post. I'm curious if we ever get to see those comments. Without seeing the comments it's hard to judge. Hopefully the mod who declined them will also answer. The issue may be that you haven't used the best flag. Possibly the no longer needed flag would have been a wiser choice. I'm cautious when raising rude flags on comments. They need to be openly rude, not just abrasive or in conflict with another user. Yes it's annoying that people chime in with unwarranted comments, just as they've perceived you've done. So the solution is in the problem. A person perceives your comment as unwarranted and decides to comment. You perceive that person's comment as unwarranted and decide to comment. 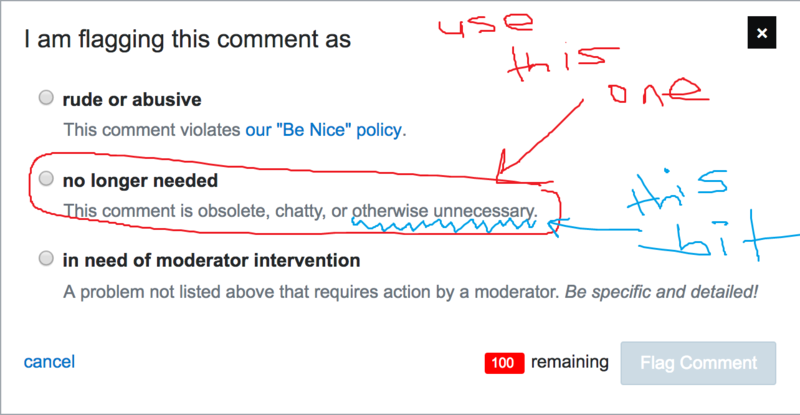 Do not reply if you think a comment is unwarranted. If you believe it shouldn't be on the site, flag it, but be mindful of which flag to choose. If someone has the mentality of wanting to make a conflicting type of comment, then they're likely to be spoiling for a fight, so there's no point to engage them. Making comments about what you see as not right on the site doesn't assist in removing it, flags do. Below is the comment thread. Unfortunately, my overlay doesn't show exactly which three were flagged and declined, so I'm going to guess. I'm guessing it was NikkiNelson's first, second and third comments. When I see multiple rude/abusive flags on the same post, I read through the entire post instead of cherry-picking and deleting from the mod queue. I remember this particular thread because I found it odd the first comment hadn't been flagged too. Now I understand that it's because it was written by you. I declined these because none of them jump out as rude. There are unneeded, which is why they were deleted, but rude? No. They talk about who's voting (and how), who's participating in the post, some bickering about rules and a threat to leave SO due to the poor interactions a user had in this post. The entire comment section was removed because there was an answer, it was acknowledged by the asker and it addressed the issues mentioned in the comments. My suggestion, if you are flagging these types of comments in the future, is to mark these as no longer needed. We are neither a consulting nor a coding nor a debugging service. Is not quite the same as pointing him to the site rules and the rest of your comment telling him that there is an urgent need for a C book is somewhat rude and insulting. Somewhat rude but far from an insult, inline with your first comment. So personally I don't see the problem with the comments themselves, you see it differently and that's fine however I do have a problem with SO's conflicting rules and lack of transparency. Your first comment and the comments that you flagged are "rude or abusive". The rude or abusive flag (formerly known as offensive) is meant to be used only in extreme cases, like hate speech, abuse against people, or abuse of the community or system. They are not "rude or abusive" but the top of that post says that the rules are different on SO and links to Let's get aligned on how spam flags can be used which talks mostly about spam and I don't even know what to make from it. 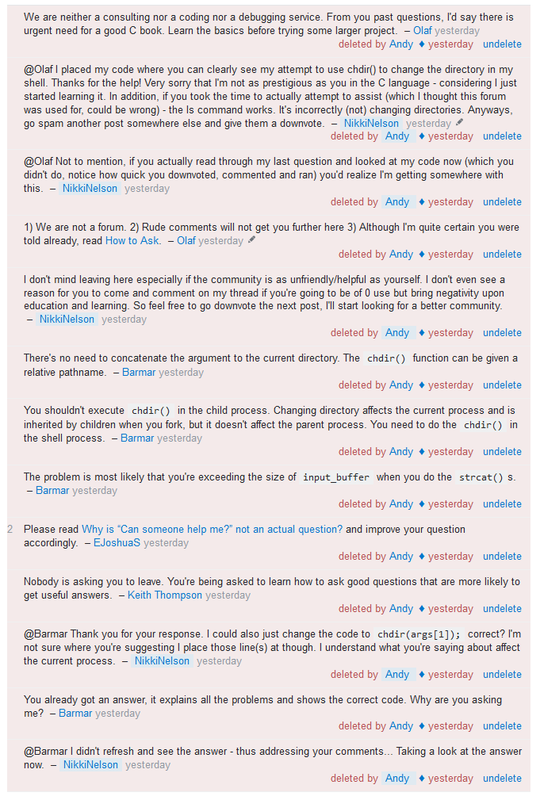 According to https://meta.stackoverflow.com/a/356997/1398418 if comments don't jump out as rude to @Andy they are not "rude or abusive". All this is confusing and even someone who tries very hard to do everything "by the book" can easily get it wrong for which you are punished by a "flag ban" and not only that SO for some reason(some crappy reason that I don't remember but I remember it not making sense) hides your "flag ban"(and other bans) status. This is frustrating and infuriating and I understand why you're riled up about it, my solution is not to take this site seriously, every day can be the day I had to much and then I will just leave. How did these “not-an-answer” flags get declined?